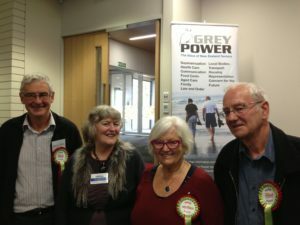 While the voting papers are coming in slowly, there are over fifteen Greypower members standing across the city, so we are confident we will gain improvements for seniors, says Anne-Marie Coury, President of Auckland Greypower. A Seniors’ Advisory Panel is strongly supported by all the major mayoral candidates, claims Ms Coury. This will lead to an improved two way communication system between seniors and the Council staff and elected representatives. The issues for seniors are improving the rating system, removing some of the excessive burden on those on a fixed income, ensuring accessible and affordable public transport, retaining the Gold Card subsidy after 3 pm, affordable housing choices for downsizing, increasing community safety and provision for seating and toilets in open space areas, while preserving heritage buildings, cone views, and local neighbourhood character. Greypower is working hard to ensure seniors voices are being heard.